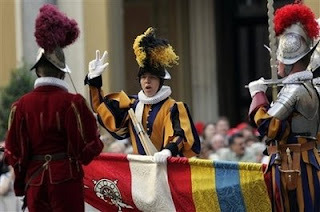 Perhaps use the Pontifical Swiss Guard’s salute? Hey guys, I haven’t been on this site in a while. Hey, guys. I was wondering if you could give me the lyrics to the songs in the “Praising Him Loudly” compilation. I’d really appreciate it, since I love these songs so much, and I want to sing along with them! I don’t know if you give a monkey’s about politics, but I ran into this article today. What are your opinions on this, guys?